The owner of a party bus company in Lansing was sentenced on Monday after being convicted for trying to escape jail time. CLINTON COUNTY, Mich. — The owner of a party bus company in Lansing was sentenced on Monday after being convicted for trying to escape jail time. 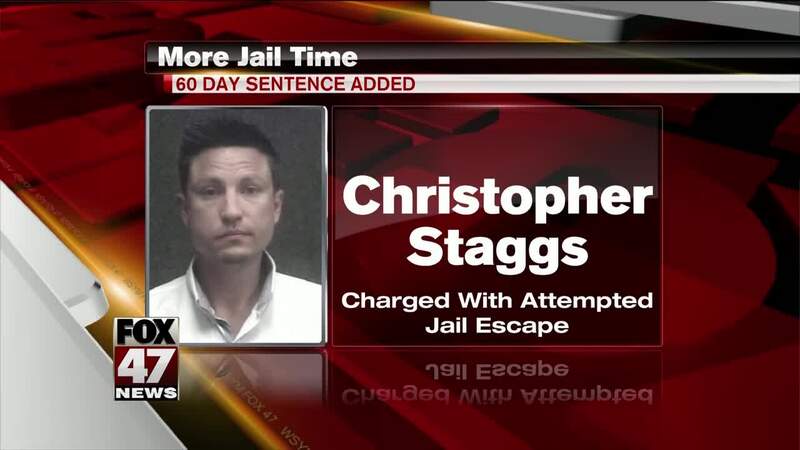 FOX 47 News first reported about Staggs in October 2017, when he was accused of leaving dozens of Michigan State University students at an apple orchard near St. Johns after his buses were impounded for not having insurance. He was found guilty by a jury in June 2018 on a misdemeanor charge for not having insurance on a motor vehicle. He was sentenced to a year in jail on that charge. But while awaiting trial on that charge, Staggs tried to forge a judge's signature on a release form. He was found guilty on an attempted jail escape charge in November 2018. He was sentenced by Judge Randy L. Tavonen in Clinton County Circuit Court to 60 days in jail, consecutive to the one year he is currently serving.